Hard Lines - ZineWiki - the history and culture of zines, independent media and the small press. Hard Lines was a science fiction fanzine by Howard Lyons. Published in Toronto, Ontario, Canada, in the 1950s, Howard Lyons was a member of "The Derelict Insurgents", a group of science fiction fans associated with the fanzine Canadian Fandom. Hard Lines was an apazine for Offtrails Magazine Publishers Association (OMPA). 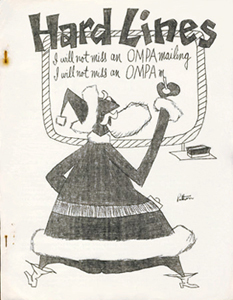 The first issue appeared in December 1955, was included in the mailing of OMPA 6. The second issue was published in June 1956, and was included in the mailing of OMPA 8. Cover art was by Pat Patterson. Howard Lyons also published the title Ibidem. This page was last modified on 2 January 2018, at 14:16.